Each of our classes have two Eco-Monitors who serve in their role for half a term before passing the role onto new Eco-Monitors. They wear badges so they can be easily identified by children in their class and around the school. Meetings are held twice per half-term to discuss their successes and areas they would like to tackle. We carry out site visits around the school to check that important aspects of sustainability are being maintained. They also have an important role to play in feeding back information to the class teacher and the class. Like most schools, we are part of the Local Authority’s recycling scheme and we recycle our plastic, cans, paper and glass. We also make sure that food waste is sent for composting. But at Long Meadow, we try to take it one stage further by providing a hub of recycling for our school community. Spectacles are collected and sent out to help the people in the developing world. Used pens are recycled and sent off to a recycling factory. Batteries can cause tremendous damage to the environment if they find their way into landfill so our battery bin has an essential role to play. 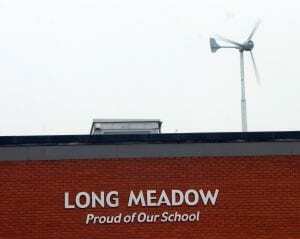 We are very fortunate at Long Meadow to have two sources of renewable energy. Both our wind turbine and our solar panels generate electricity to supply the school, but also they also supply us with an income due to the energy we feed back to the grid. Each quarter, electricity companies supply us with a feed in tariff. 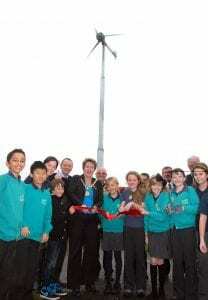 Both the solar panels and the wind turbine were fully funded with grants and did not require additional funding from the school budget.